The first problem with an day as an autism parent is thinking you've got it under control. I woke up with a BRILLIANT amount of undisturbed sleep today. 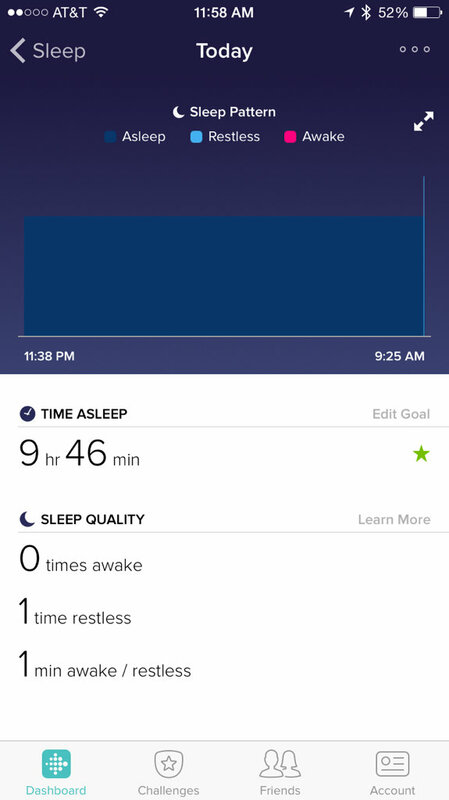 My Fitbit told me that I didn't even have restless time in the night, I slept like the dead all night. It was the first night I didn't have 8+ restless times, or even awake times in the mix. That little line showing "restless" is really me waking up as Charlie touched my arm gently a couple of times. All signs at this point in the day pointed to GOOD. I served breakfast and Miles didn't eat. That's USUALLY a sign that something is up, he didn't even come DOWN to eat. He didn't get upset about being CALLED to eat (usually if it's gonna be a bad day he'll meltdown over being told to come eat. Why? Autism.) However, no resonse, no protest, no anything seemed...off. But I thought "Maybe just MAYBE he's just chill." 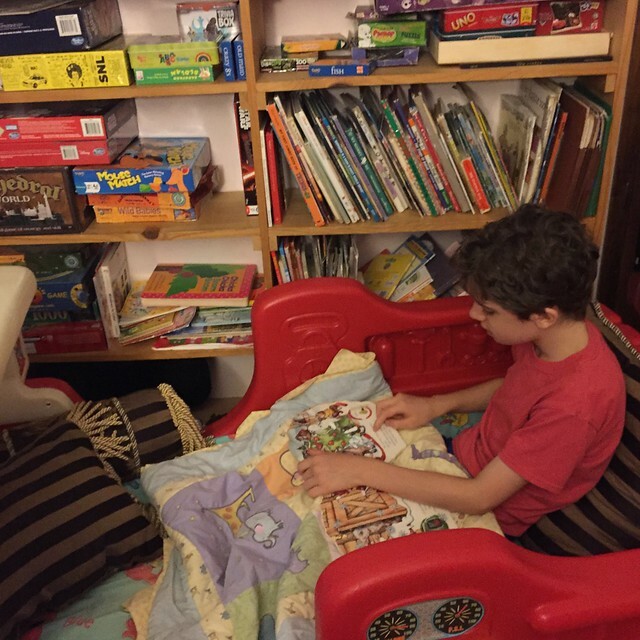 We recently moved the todder bed from Julia's room and are using it as a kids daybed/sofa in the computer room and he LOVES that, he's behind me in it at this very moment reading. After breakfast I decided it was time to get back to the business of getting healthy. I set my fitbit to track my walk/run/stumble/struggle and told Louis if Miles came down to pour him some Cheerios at least. I set out for my walk. After a mile and a half of huffing and puffing fat girl hell I returned home and collapsed in my chair. I slammed one water then two and then realized my blood sugar felt a bit off, so I should eat something. My hubby was good enough to pick me up some egg bagels (one of my faves of the grocery store variety) so I popped those in the toaster and marveled at the amazing red horror my face was. "That can't be healthy..." I think as Miles comes into the kitchen. He wants food, so I pause and pour him a bowl of cereal, make some toast, sausage and applesauce for him and he sits happily in the dining room feasting on his bachelor breakfast, no one around to bother him seems to make him happy sometimes. I resume making myself something, should I have an apple? Am I that hungry? When he says "I need help" and turns around. The entire back of his pants is soaking wets and...slightly brown. 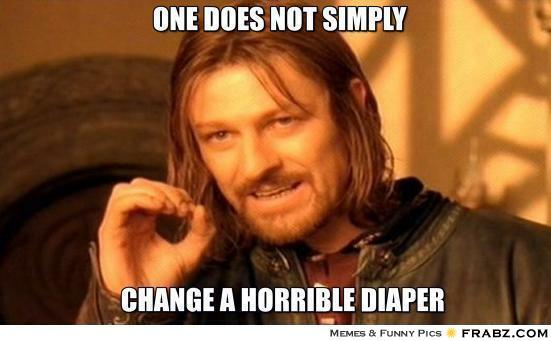 We dash upstairs and to my delight it was just a ridiculous amoutn of pee - there wasn't any poop in his diaper at all. TMI? Don't care. This is my LIFE. I changed Charlie too for good measure, get Miles new shorts, go downstairs and disenfect that chair just in case and then wash my hands forever. THEN, resume my food. Cream cheese, oh good it's not light because I WANT ALL THE FAT RIGHT NOW I AM SO HUNGRY. Apple? Maybe apple. Apple could be really good. I'm conscious of HOW MUCH cream cheese I put on, pour more water, grab my Margaret Atwood book from the library and collapse in my chair. The oldst boy is killing things in Mordor, the girl is going upstairs to "make her bed" or something and I am at peace. At that moment, Miles comes flying DOWN the stairs...and said "HELP PANTS!" And shows me the poop running down his leg. I KNEW THOSE PANTS WERE BROWN FOR A REASON OMG I JUST KNEW IT. Imagine if you will a truck driver who has eaten nothing but truck stop food (which actually can be pretty good if you've ever been to one) for days and was also constipated for days but suddenly is now not constipated. Imagine that trucker depositing natures call into my 12 year old's diaper, if you will. And now imagine you're me. There is cleaning there is so much cleaning and then I realize there is nothing for it but to simply bathe him. To the shower we go, scrubbing with a soap called Happy that doesn't smell as good as it sounds - but smells WAY BETTER than poop. Scrubbing the hair, scrubbing all of him while he giggles because showers are funny. He thinks he's had a hilarious adventure, eating alone, getting a shower, really he's having this grand day. Plus I'm pretty sure HE FEELS BETTER than whatever he felt like 20 minutes ago. I get him dressed and sorted, change Charlie AGAIN and walk slowly and stiffly down the stairs. My food, water and book are still waiting. Both the food and water are cold, which is bad and good. I eat and read and consider my own shower, which by now I've had dear reader. You'd smell me from your seat had I not. That's autism parenting. Plan, plan, plan REACT REACT REACT REACT. Sometimes not in that order. He's behind me reading, clean and shiny and happy. It's a pretty good day after all.